The current study evaluated the impact of a 20-week mindfulness training program on executive function (EF), internalizing and externalizing behavior and social skills in a clinical sample of adolescent boys with learning disabilities (LD). Integra Mindfulness Martial Arts (MMA) is a manualized group treatment program incorporating elements of mindfulness meditation, cognitive behavioral therapy (CBT), behavior modification and mixed martial arts. Adolescents (ages 12–18; n = 60) with LD were assigned to the MMA or wait list control group (WL). Adolescents and their parents completed standardized questionnaires before and after training. Subgroup analyses were conducted to investigate the impact of the intervention on youth with co-occurring attention deficit/hyperactivity disorder (ADHD) or anxiety. Compared to the WL group, MMA participants with co-occurring ADHD (14 MMA, 14 WL) improved on parent-rated externalizing behavior, oppositional defiant problems and conduct problems. Boys with elevated hyperactive/impulsive symptoms (12 MMA, 17 WL) improved on parent-rated social problems and monitoring skills. Boys with elevated inattentive symptoms (15 MMA, 18 WL) improved on parent-rated social problems. Boys with elevated anxiety (12 MMA, 17 WL) reported decreased anxiety. MMA shows promise as an alternative treatment option for youth with LD and co-occurring difficulties. This research was funded by the Social Sciences and Humanities Research Council of Canada. The authors appreciate the contributions to this study from Integra clients and their parents and several current and previous Integra staff including Margaret Amerongen, Richard Cummings, Leslie Daniels, Michael Faye, David Jan Jurasek, Alisa Kenny Bridgman and Marjory Phillips. Allen, N. B., Blashki, G., Chambers, R., Ciechomski, L., Gullone, E., Hassed, C., Knight, W., McNab, C., Meadows, G. (2006). 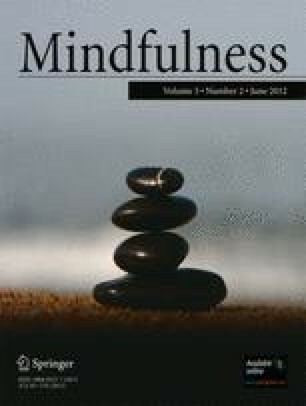 Mindfulness-based psychotherapies: A review of conceptual foundations, empirical evidence and practical considerations. Australian and New Zealand Journal of Psychiatry, 40(4), 285−294. doi: 10.1080/j.1440-1614.2006.01794.x. Rausch, J. R., Maxwell, S. E., & Kelley (2003). Analytic methods for questions pertaining to a randomized pretest, posttest, follow-up design. Journal of Clinical Child and Adolescent Psychology, 32, 467–486. doi: 10.1207/S15374424JCCP3203_15. van der Oord, S., Bogels, S., & Peijnenburg, D. (2011). The effectiveness of mindfulness training for children with ADHD and mindful parenting for their parents. Journal of Child and Family Studies. Advance online publication.. doi: 10.1007/s10826-011-9457-0.